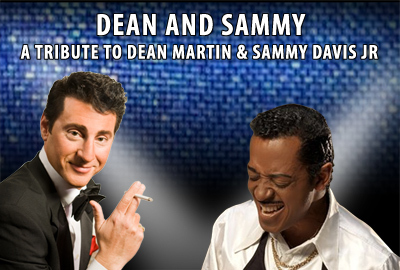 Dean and Sammy captures the music, dynamic personalities and comedy made famous by these two great performers. The show is like no other since it features two of the best tribute artists in the business. They sing all the songs made famous by Dean and Sammy. Joe Scalissi will sing many of Dean's hits with his smooth laid back delivery and tell funny stories. David Hayes as Sammy will sing, dance, impersonate and tap dance just like Sammy. Both these outstanding performers not only look like the originals but also sound like them. You don't get any better than Joe as Dean and David as Sammy Davis Jr.
Joe Scaliisi is considered to be the most authentic Dean Martin Tribute artist in show business. He looks and sounds like Dean as well as having a natural quick wit and an endless supply of one liners. He sings all of Dean's most popular songs including such hits as "That's Amore" and "Everybody Loves Somebody Sometime" as well as his stories are continually amusing. Joe has performed in Las Vegas, Reno as well as theatres, clubs and Italian Festivals across North America. "I was sitting there while Joe was performing, I thought it was dad but it was Joe"
David has been performing as Sammy Davis Jr. since 1991. he sings like Sammy, tap dances, plays the drums, does impersonations and also looks like Sammy. He sings all of the songs made famous by Sammy, including "What Kind Of Fool Am I", "Candy Man", and many more. He has earned the title, in Fun & Gaming Magazine, of "Best Performer in a Production Show" four years in a row, followed by "Best Act". David is a unique, multi-talented performer who also regularly appears as Sammy Davis Jr. in various Rat Pack tribute shows across the country. "That was the best singing impersonation of me that I've heard." Compliment from Sammy Davis Jr. after one of David's shows in Atlantic City.